Emerald Ash Borer (EAB) is an exotic, invasive insect native to Asia, and was first detected in Michigan sometime in 2002. It is believed EAB was imported to the states from Asia via wood packing material. EAB larvae burrow under an ash tree's bark creating galleries which disrupt the flow of water and nutrients essential to the tree's health. If left untreated, EAB infestations ultimately lead to the tree's death. Adults are dark green, one-half inch in length while one-eighth inch wide and will only fly from April until September. We have 23 Ash trees on our property in Chili. Mike (The Ash Tree Medic) injected them all in 2010, and many again in 2014. None of our trees have shown signs of being infected and they are all alive and healthy. A few of our neighbors also treated their trees, but some did not. Most of the untreated trees are dead or dying. Our local area is heavily infested with the ash-borer. The first indication that a tree is infested is significant visible woodpecker damage. We have none of that. We will treat them all again this spring. Drive by and see our trees this summer. How Do We Help Save Your Ash Trees? M.J. Cullen uses Arbor Jet products. Arborjet's products are ranked #1 in University studies and have gained respect from arborists and landscape professionals worldwide. Property owners are asking for Arborjet service providers that can offer tree injection as a safer treatment alternative to spraying or soil drenching. What is the Arbor Jet Process? 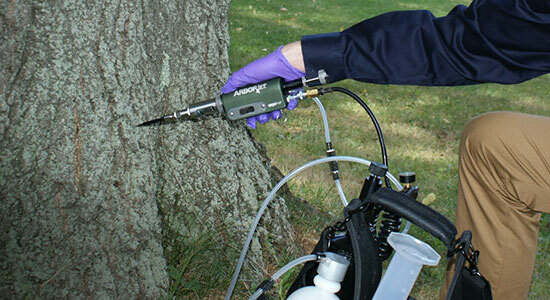 The Arborjet drill-plug-inject method is easy to learn and the application is quick. The Arborjet system can be used for high production treatments. Unlike spraying or soil drenching, Arborjet's closed system injects directly into the tree, protecting your customers, the applicator, and the environment. The visual symptoms associated with emerald ash borer infestations are nearly identical to those we often see on ash that are infested or infected by other pests and diseases commonly found in New York. Therefore, it is important to look for a combination of at least 2 or more symptoms or signs when trying to determine the presence of emerald ash borer. Dieback of the upper and outer crown. Trees begin to show dead branches throughout the canopy, beginning at the top. Foliage in the top of the tree is thin and discolored. Epicormic sprouting at the base and/or on the main stem of the tree. Trees may sucker excessively both at the base of the tree and on the trunk, often just below where the larvae are feeding. Vertical splits in the bark are caused due to callus tissue that develops around larval galleries. Larval galleries can often be seen beneath splits. Woodpeckers feed on emerald ash borer larvae located under the bark. Feeding is typically evident higher in the tree where the emerald ash borer prefers to initially infest. View the signs of emerald ash borer infestation. As adults emerge from under the bark they create an emergence hole ~ 1/8 inch in diameter and D-shaped. As larvae feed under the bark they wind back and forth, thus creating galleries that are packed with frass and sawdust and follow a serpentine pattern. Larvae are cream-colored, dorso-ventrally flattened and have pincher-like appendages (urogomphi) at the end of their abdomen. Mature larvae reach 11/2 inches in length and all larvae are found feeding beneath the bark. Adult beetles are metallic green in color and are 3/8 - 1/2 inch in length and 1/16 inch in width. Adults are dorsally flattened and ventrally rounded. 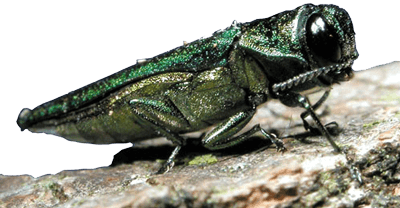 We provide emerald ash borer treatment in: Rochester, East Rochester, Webster, Victor, Pittsford, Penfield, Macedon, Spencerport, Henrietta, Fairport, Ontario Center, Newark, Batavia, North Greece, Canandaigua, Rush, Ontario, Brockport, Honeoye Falls, West Henrietta, Geneva, Buffalo, Hilton, Geneseo, Dansville, Walworth, Lima, Penn Yan, East Bloomfield, Holley, Byron, Clifton Springs, Bloomfield, Clarkson, Hornell, Ithaca, Medina, Mendon, Scottsville, Avon, Seneca Falls, Waterloo, Alden, Kauka Park, Livonia, Williamson, Auburn, Palmyra, Warsaw, Fishers, Perry, Corfu, Romulus, Stafford, Sodus, Honeoye, Rushville, Bath, Watkins Glen, Oswego, Wayland, Albion, Farmington, Le Roy, Retsor, Seneca County, Union Springs, Arcade, Monroe, Phelps, Lyons, Hamlin, and western New York. We begin tree inoculations in Vermomt in June of 2018!